The variety of activities offered in St Lucia cater for your daily needs, whether you're in the mood for an adrenaline-fuelled zip-line ride above the rainforest, or a soothing dip in the island's natural sulphur springs. With plenty of stunning landscapes to admire, whether from a yacht, a bike, or a helicopter, St Lucia's nature is also great entertainment in itself: hike the majestic Pitons National Park, take a drive to the Caribbean's only drive-in volcano, take a dive in the island's aquatic beauties, and make unique encounters at the various dolphin, turtle and whale watching points. Inland, stroll around the century old Castries Market, wander the streets of picturesque Marigot Bay, or discover the island's heritage through its old plantation estates, rum distilleries and Lushan life museums. When it's time to relax, take a leisurely walk around the botanical garden, or treat yourself to a rejuvenating treatment at one of the island's world-class spas. On the South West coast of the island, in the town of la Soufriere, lies the island's majestic UNESCO World Heritage Site. Providing great spots for snorkelers and divers, whilst walkers will be delighted by the Gros Piton Trail, a 4 to 5 hours trek to the top of the mountain and offering breathtaking views of the island. This easy to moderate 45 minutes walk is a great way to explore the island's flora whilst enjoying stunning views of the island and its surroundings, from Sugar Beach and the Petit Piton to St Vincent and Martinique. The trail also takes you through an old traditional house where the St Lucian's ancestors used to live. Located in Soufriere, this site houses a wide variety of plants and a beautiful collection of flowers, making it every nature lover's ideal spot. Originating from underground thermal springs, the beautiful waterfalls offer mineral baths reputed for their therapeutic benefits. If you fancy a stroll around a bustling market, a Saturday trip to the 100 year old Castries Market is a key thing to do in St Lucia; you'll find lots of interesting things to look at, plus a whole spread of foods such as bananas, the day's seafood catch, local spices such as mace, nutmeg, cinnamon, cocoa and hot pepper sauces, which make great gifts and souvenirs. Once used as a military base and lookout point at the time when the British and French were fighting over St Lucia, this National Park is now regarded as one of the island's most notable landmarks. Today, visitors can explore the old site's military remnants and museum, as well as enjoy impressive views of the Caribbean Sea and Atlantic Ocean - the perfect spot for a picnic, or wedding ceremony. A family owned and run tour and an authentic insight into the Saint Lucian culture. Explore the St Lucians' ancestors and forefathers traditional houses, discover the island's spices, fruits and tropical birds through the garden and rainforest trails. A tour for the whole family to enjoy. A traditional and still fully operating cocoa plantation sitting on 135 acres of land and that takes visitors through the fermentation, drying process and roasting of cocoa beans. The estate also offers a number of trails through its cocoa trees and exotic crops. The Caribbean's only drive-in volcano, where visitors can learn about the formation of volcanic craters as well as the therapeutic properties of sulphur mud and mineral waters. Demonstrations of traditional Cassava bread-making, crayfish catching, honey collection and log-sawing, and a live chak chak band, showcasing the island's vibrant Creole heritage. 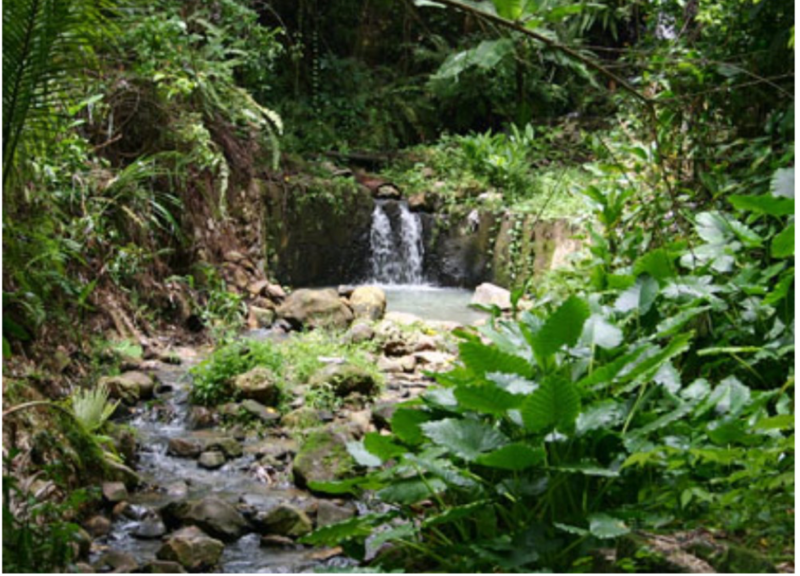 Located in Micoud and spread over 12 acres of woodland, these gardens offer a variety of hidden gardens packed with stunning flora and fauna, a mini banana plantation, as well as a newly added Creole medicinal herb garden. A horseshoe-shaped bay with a man-made lagoon abundantly lined with golden sand, a thriving hub of activities packed with resorts, great nightlife, and a marina. Spend a relaxing day at the beautiful Reduit Beach and enjoy a bit of shopping at the Bay Walk Mall before diving into the variety of cafes, restaurants and night clubs, or heading to the Treasure Bay casino. You cannot miss this great event, tourists and locals mix and have fun! Anse La Raye fish fry is a popular Friday night destination… Long-established and enjoying continued popularity is the Gros Islet Friday night "Jump Up" for locals and visitors alike. A more exciting take on sightseeing, this zip-line adventure is a great way to explore the island's whilst admiring some stunning views of the Petit Piton, Soufriere and the Caribbean Sea. The family-friendly tour takes you through the coffee and cocoa plantations of the Morne Coubaril Estate and its beautiful coconut, mango and plum trees, as well as its beautiful bamboo lined gorge. A guided tour up Mount Pimard taking visitors through the island's fauna and flora, and various points of interest such as World War 2 Bunkers, with stunning views of the island's coastline, including Pigeon Island and Rodney Bay. Some of St Lucia's longest and highest zip-lines, located in Dennery, on the east coast of the island and offering an exciting way of exploring the lush rainforest. Cycling can be a great way to explore the island, giving you more time to take in all its beauty. A guided ride along the East coastline will take you through beautiful rainforest trails, with a refreshing stop at Dennery's waterfall and plenty of beautiful picture opportunities. There is no better way to see the breathtaking scenery of St Lucia that aboard a helicopter; it’s a once in a lifetime experience! Your pilot's informative and lively commentary will bring to life the past of present of St Lucia, helping to create an experience which you won't soon forget. With 6 endemic species and a total of 167 bird species, including the island's national bird, the St Lucia Parrot (Amazona Veriscolor), the island is dotted with many bird watching sites, making it the perfect place for nature lovers. With over 20 species of whales and dolphins living in and visiting the surrounding waters, St Lucia is the perfect place for marine life watching. A great tour introducing you to humpback, pilot and sperms whales, as well as spinners, bottleneck and spotted dolphin, perfect family day out! At the heart of the island, the Millet Bird Sanctuary Trail offers the opportunity to spot over 30 species of birds, including 5 of the island's endemic species - the Saint Lucia Parrot, Saint Lucia Black Finch, Saint Lucia Oriole, Saint Lucia Pewee and Saint Lucia Warbler - as well as great views of the Eastern Caribbean's largest dam, the Roseau Dam. Two horse-riding centres offer tours for visitors to explore the island on horse-back, riding through the banana plantations, beautiful coastline and pasture lands. From March to August, camp overnight on Grand Anse beach for a chance to spot the Leatherback turtles lay their eggs - a truly unforgettable experience! From duty free shopping malls to local craft market, the capital of Castries offers many shopping opportunities for leather goods, trinkets, gifts, perfumery and jewellery. Or wander around the boutique, international brands and restaurants of BayWalk Mall in Rodney Bay Village. A fun tour liking the island's rum production to its cultural heritage. Visitors are taken through the distillery's family history and the process behind the production of rum. The tour ends with a colourful demonstration of local carnival traditions accompanied by steel band music and rum tasting. Scuba diving experiences catering for both beginners and experts can be found all around the island. From boat dives to night dives, surround yourself with some of the Caribbean's most colourful and serene deep-sea wildlife. A mix between scuba-diving and snorkelling for the whole family to enjoy, Snuba does not require any diving experience or certification and is accessible to those with basic swimming skills. An exciting way for the family to discover the sub-aquatic life of St Lucia together. Located on the hills of the Cap Estate, in the north of the island, this stunning 18-hole, par-71 course is one of the most challenging rounds in ­the Caribbean. For the best diving and snorkelling on the island head to Anse Chastanet beach where you can hire all the equipment, guides and book your trip; they offer boat diving, night dives and wreck diving as well as snorkel tours for those who like to remain closer to the surface. A Mask-free alternative to scuba and snorkelling that enables trekkers to breathe freely under a sea-trek helmet sitting on their shoulders and continuously fed with oxygen through a hose attached to a Pod system. This clever helmet enables trekkers to observe the aquatic wildlife whilst staying dry throughout the experience! Situated next to Hewanorra Airport, this 8,000-seater has a regulation football pitch, a 400m all-weather athletics tracks, as well as high jump, triple jump, long jump and pole vault runways. Most snorkelling spots are located on the west coast of the island, where crystal clear waters and vibrant coral reefs house a colourful variety if tropical fish, sometimes only a few yards from the shore. Built in 2002 and renowned both regionally and internationally, this site is regarded as one of the Caribbean's finest grounds and was host to the International Cricket Council's World Cup in 2007. Adjacent to the ground is the Beausejour Indoor Practice Facility, home to netball, volleyball and basketball. St Lucia's National Tennis Centre features 6 courts (including a stadium court) and has already hosted prestigious tournaments such as the Eastern Caribbean Tennis Tournament, despite having been built fairly recently.